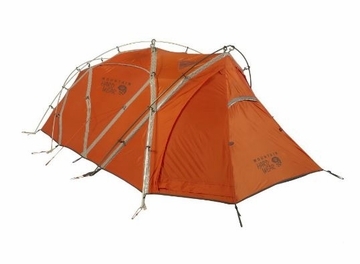 The perfect balance of space, strength and compactness in single-walled expedition tents. Built to endure the extreme conditions of high-altitude expeditions, the EV3 is strengthened and stabilized by Mountain Hardwear’s Evolution Tension Arch™. Integrated vestibule provides adjoining storage and food-prep area outside of main living space. Built to endure the extreme conditions of high-altitude expeditions, the single-wall EV3 offers the perfect balance of strength and compact size. Minimum Weight: 6 lb. 6 oz. / 2.90 kg. Packed Weight: 7 lb. / 3.17 kg.